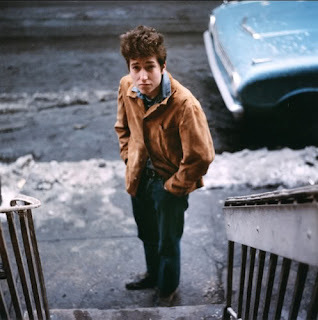 Young Bob Dylan didn’t often write gentle songs. Those addressed to a girl were usually angry, critical, upbraiding, if not down-right mean. Hate songs more than love songs. The one that pops to mind is, of course, ‘Like a Rolling Stone’, but you don’t have to think hard to come up with a whole string of them through his golden period of the mid-60s: ‘Don’t Think Twice’, the stunning ‘One Too Many Mornings’, ‘I Don’t Believe You’ (She acts like we never have met), ‘She Belongs to Me’ (She’s got everything she needs), to pick one from each of the masterpiece albums that preceded “Highway 61”. But there are, hidden here and there, chinks in the armor, fleeting glimpses of vulnerability. They’re the soft underbelly of the list above – she did, after all, get to him. And there are a few songs in which the chip slips off his shoulder, his guard down, his sunglasses in his pocket, his heart open. The well-known ‘Girl from the North Country’; the gentle, vulnerable ‘One Too Many Mornings‘; the wrenching, under-appreciated ‘Boots of Spanish Leather‘; and this week’s SoTW, ‘I’ll Keep It with Mine’. Oh, right, there’s a third reason to take a listen to this song. It’s the only Dylan song I can think of from the 1960s that he misrecorded. Just flat out missed the point of the song. He bangs away at the piano and shouts the lyrics at way too fast a tempo. (Of course, ten years later he began several decades of rapid-fire shouting of what should have been whispered slowly). One of the several early cover versions our SoTW, though, came close to hitting it on the head, that of Fairport Convention. They’re a leading voice of the English folk movement transmogrifying towards rock in the mid-60s, along with Pentangle and John Martyn. Their lead singer is Sandy Denny, a British Judy Collins, and I sure like Richard Thompson’s acoustic guitar leading a rock setting. Their treatment here really isn’t anything spectacular, just a tastefully wistful, properly laid-back rendition of a lovely and puzzling song. I guess when all the sound and fury and high-falutin’ talk is over, what we’re left with is one darn pretty song.And if anyone out there understands it, please let me know. The person who nailed it was Nico, of Velvet Underground fame, on her album Chelsea Girls. It is exquisite. I think Dylan wanted to bang her (who wouldn’t? ); it never came to fruition, but he “laid” this song on her instead. It is exquisite. I’ll be glad to explain it to you – for a small fee. BTW – For me, Dylan’s version is better. Susanna Hoffs-vocals (Bangles) / David﻿ Roback – gtr, tambourine, Will Glenn – violin. Rainy Day was a project of the Velvet Paisley Underground. They did a great job with the song. If this song wasn’t by Bob Dylan no one would listen to it. I’ve listened to FC’s recording of this song many, many times especially when I need solace. I do love Nico’s version, but Richard Thompson’s gentle searching guitar and Sandy Denny’s gorgeous delivery of the words moves me. Recently, I was struck by the thought that Dylan’s lyrics may have been, consciously or not, intended much the same as the verse from Matthew, “Sufficient unto the day is the evil thereof.” Perhaps it’s meant as a generous offer to take on someone else’s suffering. At least that’s how I like to think of it. Sorry, I don’t understand the quote, the connection. Please do explain.